The purpose of this guideline is to establish the standard for proper appearance of referees while officiating Rhode Island games. Requirements for out of state matches may differ. Your appearance as a referee sends a message to players, coaches, spectators and your fellow referees. That first impression is vital. If you expect to command respect you must look and act professional! 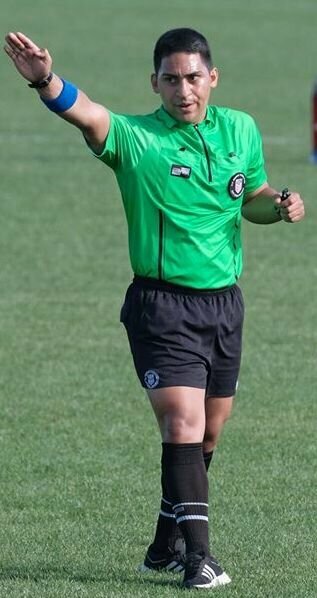 In order to promote a professional appearance by all referees statewide, all new referees will have the opportunity to purchase, at the time of registration, a complete referee uniform set, which includes two jerseys (black and gold), shorts, and socks. Note: Referee shorts and socks are specifically manufactured to provide an appropriate professional appearance. Other types of shorts or socks are NEVER permissible while officiating. In addition, the SRC will offer the uniform “kit”, which includes both a black and gold jersey, shorts, and one pair of socks. Footwear: Referees are expected to wear athletic footwear which is primarily black in color. White footwear is NEVER permitted. Cleats, turf shoes, or running shoes are all appropriate provided they are black. Whistle: There are two primary types of whistles used in refereeing: pea whistles, which contain a chamber with a small cork ball (a.k.a. the pea), and pealess whistles. The State Referee Committee strongly recommends the use of pealess whistles, which make a much louder sound on the field. Referees should carry two different whistles to avoid player confusion when working matches on adjacent fields. Carrying your whistle: There are a number of ways to carry a whistle on the field. The easiest, and recommended way, is to simply carry it in your hand. Alternately, some referees may prefer to use a wrist lanyard or finger grip style whistle. Carrying a whistle around a neck lanyard should be avoided! Timing device: You will need something to keep track of time while officiating. The most effective device for timing is a digital wristwatch, which can be obtained very cheaply. New referees often make the mistake of purchasing a stopwatch, which is unwieldy and conspicuous. Other equipment: In addition to the referee gear described above, you will need a set of 2 assistant referee flags, a card set (red and yellow card) with game record, a writing utensil, and a tossing coin (an ordinary quarter will do). The equipment listed in this guideline can be purchased at local soccer equipment stores, or online. In addition, uniforms and supplies will be sold by the State Referee Committee at official training events the discounted price.